Bullion Backed Digital Currencies Coming Soon! Institutions looking for allocated bullion solutions offering a full turnkey service that is both ready & easy to use, will find them through GoldVu. We provide institutions the ability to directly integrate on-line, with the world’s first and leading electronic institutional exchange for allocated physical precious metals. Add your comments at the bottom of the page. Institutions are able to access all of the major global physical bullion liquidity centres through the modern, global and integrated trading platform, MetalDesk. With the MetalDesk platform, you now have the ability to seamlessly trade physical precious metals globally on a wholesale and 100% allocated basis 23 hours a day. The modern technology of our allocated bullion solutions allow institutions and their clients, during their instantaneous trades, to always retain direct legal title to their physical precious metals without it being encumbered by any 3rd party. This sits in contrast to the majority of the current bullion markets that are hindered by their manual traditional legacy methods and whose antiquated trading systems no longer provide the necessary fluidity to trade allocated physical precious metals that modern markets and financial institutions now need and expect. FX & investment brokers commonly use platform such as MetaTrader to facilitate investment into paper based instruments. Our MetalDesk physical precious metals trading platform complements a brokers' existing services and offering by sitting alongside your current trading platforms. These allocated bullion solutions allow you to offer and easily up-sell a new service and product range to your existing client base. Full Brokerage – Fully featured with collateral, credit & margin capital facilities. This gives your clients the ability to use their bullion as collateral against which they can obtain finance which is then invested into the other asset classes & products you offer. Demo – Available for both Full & Standard versions. Contains most of the live data of the exchange for clients to try. Comes pre-loaded with $500,000 of virtual money. To see the differences between the Full & Standard MetalDesk, please see our side by side comparison of the 2 versions. We are able to exceeded the requirements of the various pensions as we can provide bullion of a fineness of 99.99%. For many years we have been seeing increasing interest, across the entire spectrum of investors, to buy precious metals as part of their investment portfolio. However, to-date, their choices have been mainly limited to various ETFs and these don’t offer bullion investments that are allocated or segregated. You can create individual funds for gold, silver and platinum or create a single fund with your own weighting of metal types. You also have the option of whether or not to segregate the bullion in your funds. GoldVu can help you to construct the most suitable funds. The vast majority of investor precious metals exposure is through paper based instruments and not its real allocated physical bullion form. With us you are able to now offer unique managed individual solutions tailored to your clients for privately vaulted bullion that can be stored globally. To increase your offering further, you can also give clients the ability to self-manage their accounts, reducing your time & costs associated with management and still receive your brokerage & storage fees. To ensure that the exchange’s liquidity is capable of meeting institutional demand, an enormous support base of liquidity providers has been put in place. Nearly 30 liquidity providers supply bullion into the exchange to support its global network of 9 precious metal marketplaces. These liquidity providers include many of the world’s largest precious metals refiners and mints. To aid in the liquidity process, the suppliers have been incorporated into a 15 day settlement cycle that is managed by the exchange’s central clearing and settlement facility. This process allows for even the largest demands to be met with in a very simple and timely manner. Institutions and brokers have the choice available to them for the MetalDesk platform to be fully white-labelled or co-branded, along with associated support documentation and brochures (such as the bullion product catalogue with contract specifications). If you don’t wish to use the MetalDesk GUI then our allocated bullion solutions provide you the capability to integrate with the exchange by FIX with a variety of customisable solutions enabling the technology to interface with third-party platforms or administration portals. Communication with the exchange’s FIX server is done using the FIX 4.4 protocol format. AML & KYC procedures for these allocated bullion solutions can be done by either the ABX or the member. Where the institution / broker wishes to on-board their own customers, the exchange uses the principle of Agency to elect its members as agents, where you are responsible for identifying and verifying your clients. Only in the event that AUSTRAC requires specific customer identifiable documentation will the member be required to provide it to the exchange. If you believe you and your clients could benefit from our allocated bullion solutions then please do contact us to discuss matters further. We can provide you with a full brokerage demonstration of Metaldesk, just contact us to have one set-up for you. 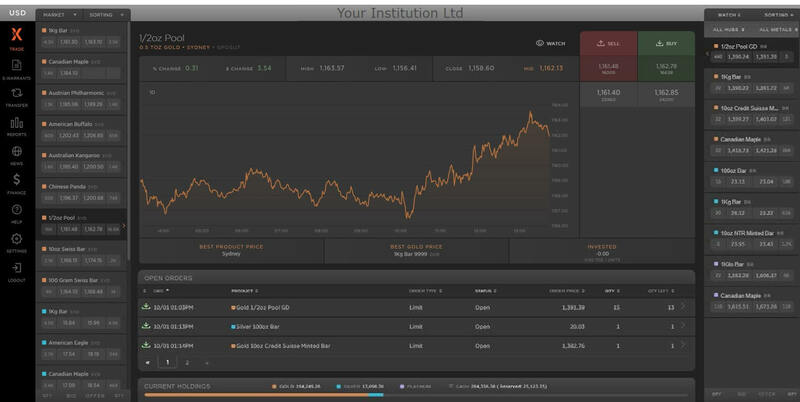 In the meantime, why not try our standard demo of the MetalDesk platform to get a feel for the system and the exchange. Please Note: All comments are moderated and manually reviewed for spam. In turn, your comment may take up to 24 hours to be posted. Copyright© 2014-. All Rights Reserved. We work to offer solutions for owning and storing physical precious metals in cooperation with specialised partners. We do not recommend or offer advice to anyone regarding investment decisions and we are not responsible for any investment decision taken by investors in addition to the fact that we are not responsible for any losses that may incur as result from the investment process that has occurred by dysfunction of any Trading platform for any reason at any time. we operate in good faith in order to ensure the functionality of the services provided and we are not responsible for any risk that may occur outside of our control.